Taste test: These are decent salt & vinegar potato chips, slightly greasier than Wachusett chips but with the same "flat" cut (the chips are flatter than curved). A good balance between salt and vinegar, there's not so much vinegar that you wince when you eat them. Smell test: A good vinegar aroma. 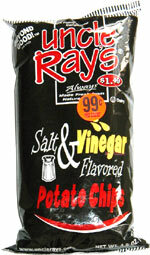 This snack was discovered by Keith and Melissa at Mister Chips Convenience store at James Madison University, Harrisonburg, Virginia. Review published .